1. Varying speed limits. 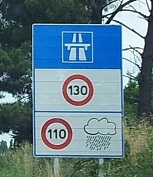 On most French motorways the maximum speed limit is 130 kph but this reduces to 110kph during rain showers. This is sensible method of limiting speed when visibility and braking distances are both reduced. Why did we, in the Emerald Isle, not think of this first? 2. Wind socks. On exposed parts of Irish motorways we have wind sock signs to indicate that it is an exposed area subject to high winds. But in France they erect actual large wind socks. This is better as it tells you additional information like the strength and direction of the wind. 3. Painted lines to indicate the safe gap to be left between cars. 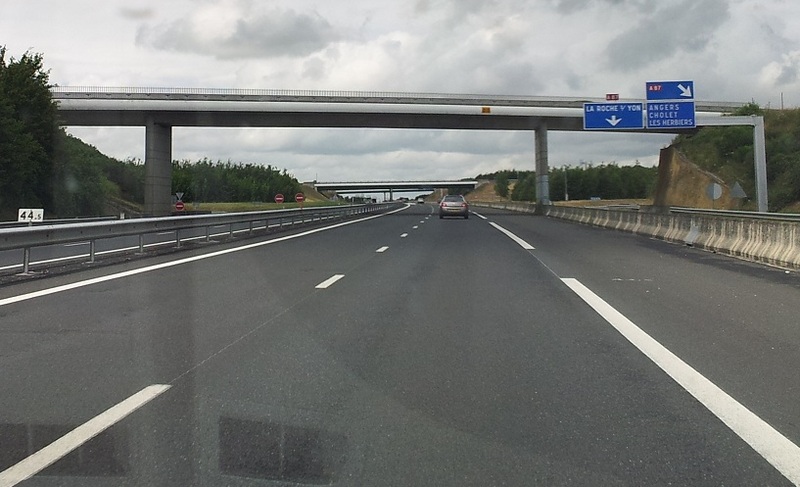 The hard shoulder boundary line is broken into sections on French motorways. This is as a guide as to the distance to keep between you and the car in front. The minimum recommended gap between cars is two strips. This is another cheap safety precaution which is easy to install. 4. Regular service and rest areas. 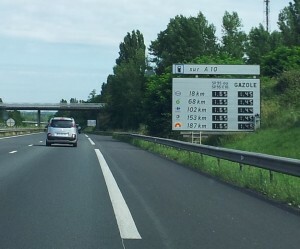 On most French motorways there are rest areas located every 15km. More elaborate rest areas with petrol stations and restaurants are located every 50km. This is an excellent standard of services provision compared with Ireland and the UK. They also are well sign posted with the price of petrol for the next 5 stations noted on the sign on the motorway verge. 5. Smoother and quieter road surface. 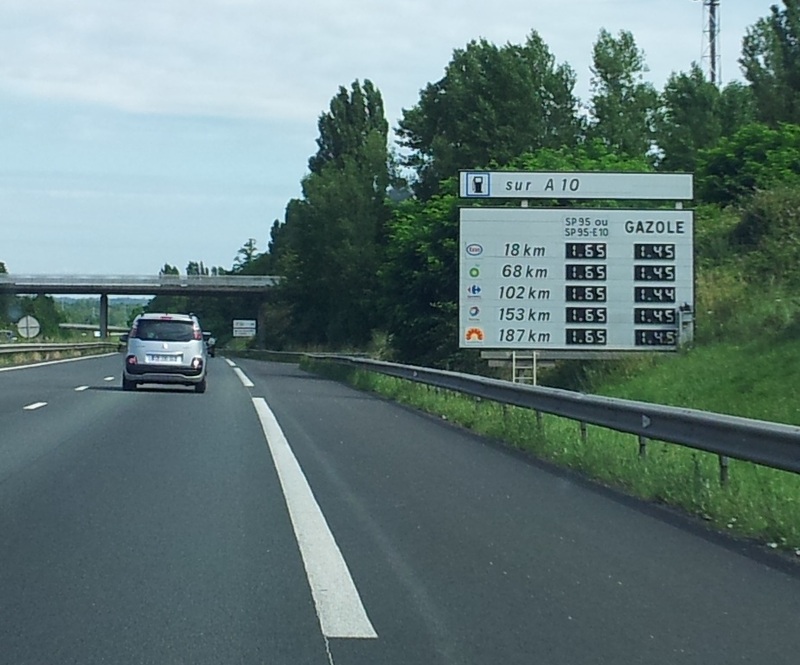 I noticed a difference in the road surface compared with Irish motorways. The aggregate used in the surface asphalt layer seemed to be a smaller size. This resulted in a quieter road and less road noise inside the car. This should be considered when we are resurfacing our roads so that road noise is less of a nuisance for people living close to the road. I heard separately that cyclists find Irish roads harder to cycle on for the same reason, as they have more ‘grip’ compared with roads on mainland Europe. I also wonder if a smoother road results in more fuel efficiency for the vehicles using it. I didn’t notice any noticeable difference in my fuel efficiency. 6. Concrete perimeter drains. 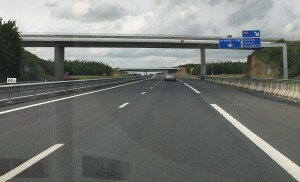 The edge drains along French motorways when used are formed with concrete and are quite deep. In most cases they are protected by crash barriers. I think this is a superior drainage system to the arrangement on Irish Motorways where ironically ‘French drains’ are usually used instead. ‘French drains’ are trenches filled with well rounded stones. They are an excellent way of dealing with rainwater but if a car or truck drives onto them there is a tendency for the stones to be thrown out on to the road surface. Stones and driving at 120 kph are not a good mix! 7. Overpasses. After a few years the side surface of concrete motorway bridges becomes discoloured and looks unpleasant. In Ireland we leave this alone, possible because most of our sections of motorways are relatively new. But in France they have clad the top of their bridges with sections of white aluminium metal and I think it really improves the look and feel of the whole motorway. What about you, do you have any suggestions from travelling to other countries for making improvements to motorway infrastructure? Hello. You’ve put together a great post here. I think it’s worth noting – with the new driving laws in France, you’ll need to carry a breath testing kit when traveling on French roads. But be sure that it displays the “NF” logo on the packaging to ensure that it’s a model which complies with the new French driving laws. That’s a good point that I didn’t mention. Thanks for that. Just to note, it’s the law to have once in the car, but you can only get a slap on the wrist for it. No fines or owt. Great observations and we could follow some of their ideas in Australia as well. In WA we have a complete Freeway system with NO rest stops….brilliant A couple more…I love the thick yellow lines that accompany roadworks and I notice the roadside surface water drains, which ironically aren’t French drains seem to feed all the water to regular basins that I guess are used to re-cycle or re-distribute the water. Did anyone watch Billy Connolly’s Route 66? When the Highway opened many small towns were literally bulldosed out without road signs or slip roads to link to these towns, some of them literally vanished. Well in my opinion, Ireland being such a small country, going from Dublin to Limerick or Cork or Sligo is merely a 2 hour drive. Motorways and service stations is a new novelty in Ireland. We never felt welcomed when dropping into a local village pub to use the facilities without buying anything, yet local facilities are all there is, road side bush. When it comes to Highway Rest Stops, South Korea, Mental!